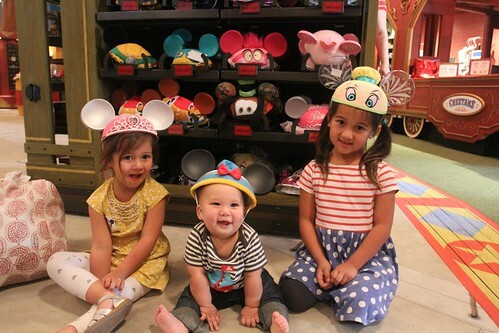 Mali Mish - Day 125: A special day at the Magic Kingdom. Our 4 nights at Fort Wilderness includes 2 days at Magic Kingdom. 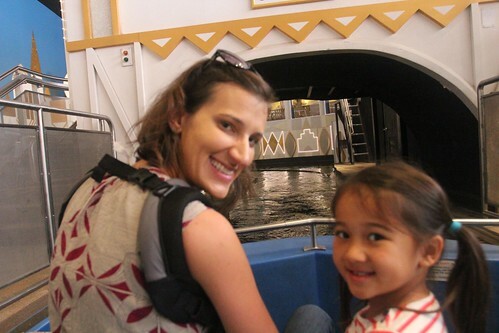 Actually we can go to any of the other parks but with our kids age, Magic Kingdom is the only way to go. For those of you out there with 2 girls under the age of 6, you know what I mean. There is no coming to Disney World and not getting to take photos with the princesses. Oh yeah, and it happens to be Marlene’s birthday. 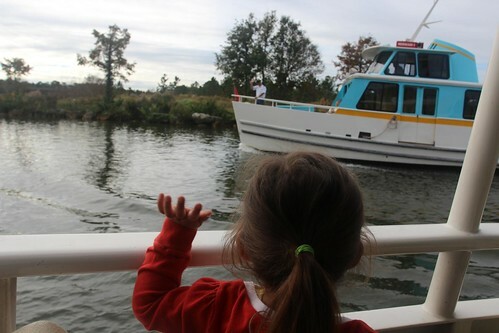 From Fort Wilderness, campers can take a boat ride directly to the entrance of the Magic Kingdom. The nice thing about where we are staying is that we don’t have to bump shoulders with everyone to get in there. 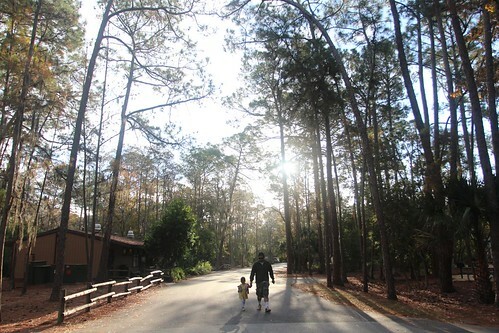 Even though Fort Wilderness is pretty big for a campground, it is in no way as densely populated as any of the other resorts. For the most part, there is no wait to get on a boat to get into the park. The girls are very excited to go to Magic Kingdom. They call it Disneyland and we don’t bother trying to correct them. If we did try to explain to them the difference, it will just confuse them and we will eventually have to explain to them why the one near our California home is actually called Disneyland. See, I am confusing myself already as I am talking about it. As far as Mila is concerned, she thinks this is her first time here. Since she was only Luka’s age last time we were here, she has zero recollection of the trip. 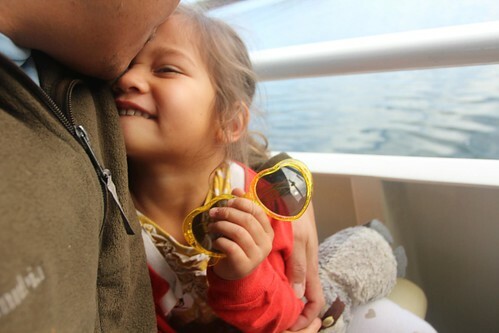 In fact, Ava barely remembers it unless we show her pictures from the blog. Here she is waving at the first mate of the returning boat as they go back to pick up some more campers. Our game plan today is to try to get on some of the more popular rides early so we don’t have to wait in any long lines. Also we found out that even though the new Fantasyland doesn’t technically open until tomorrow, they are letting people in early to check them out. Peter Pan was one of the most memorable rides for me as a kid going to Disneyland. I just remember flying over London and looking down at all of the little houses with their lights all lit up inside. That was today’s first ride. 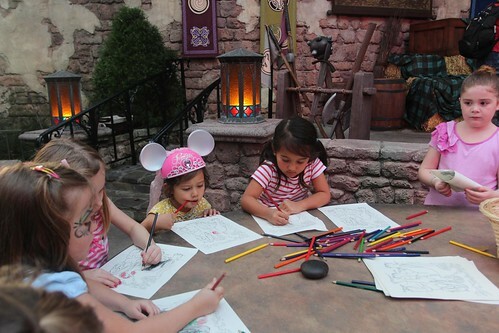 When we got to the entrance of the new Fantasyland, they had cast members dressed as Peter Pans turning people away. They actually told us that it was not ready and would be closed all day. As we were walking away, we overheard some people digging a little deeper and one of them said they it might open up periodically. I guess they are setting expectations. 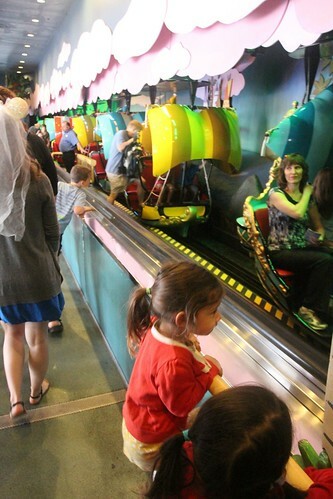 No problem, we will just go to Marlene’s favorite ride instead. It’s a Small World actually had no one in line. It isn’t a real popular ride anymore with all of the other fancy new ones and their special effects. I really hope they don’t shut it down and replace it with something annoying. In the middle of the park, a huge construction site is fenced off with scenes of Snow White painted along the side. This is part of the new Fantasyland that won’t be completed until 2014. Snow White will be one of the centerpieces of the area when it’s finished. I guess we have to come back when Luka is a little older. Let’s hope there isn’t another baby by then. And finally, Fantasyland is open. 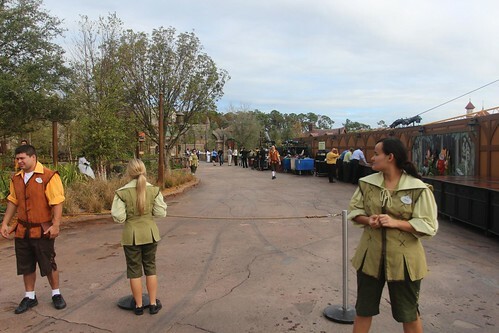 With the official opening coming up tomorrow, they are letting people in so the press can do their little show and tell with real people walking around going on rides. 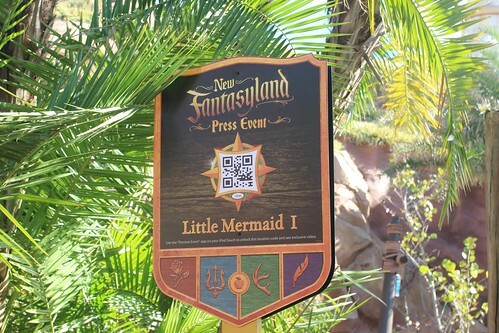 Last time we were here, Ariel’s Grotto was closed so they can work on this. The girls are thrilled to check out this brand new ride. One of the things they are doing with all of the new rides are all of the fun distractions they are peppering throughout the waiting area. It makes waiting for a ride a little more tolerable. 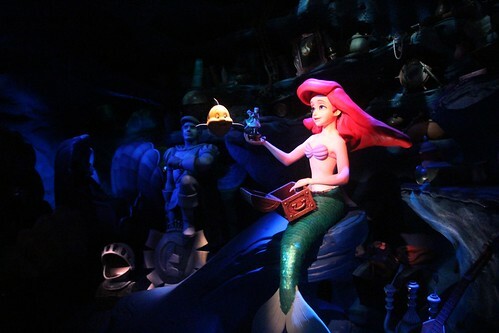 At the Little Mermaid ride, there are all of these undersea treasures with holographic projections of little crabs hauling around objects in and out of their spaces. 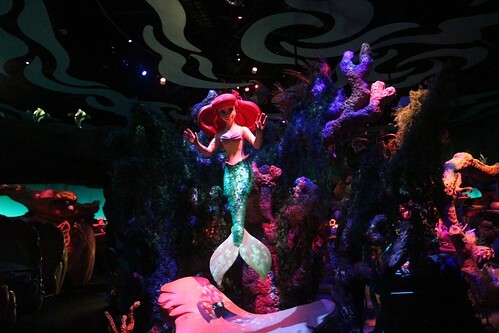 The ride basically tells the story of the Little Mermaid movie. The animatronics are getting much better than the older stuff. 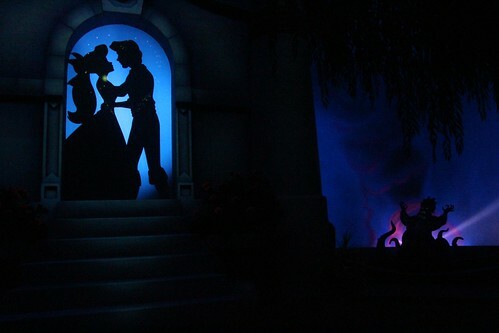 The movements of the characters are so much more life-like instead of having that robotic-jerk as from the older rides. 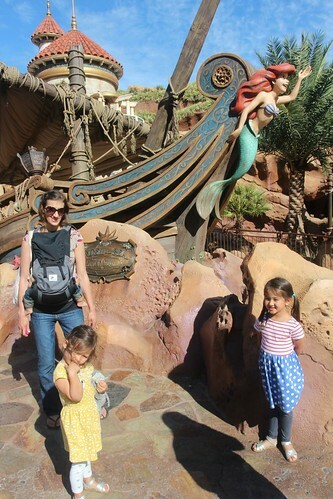 Ava was at the peak of her Ariel obsession during our last visit. She has moved on to other things but it is still a fun ride for her. 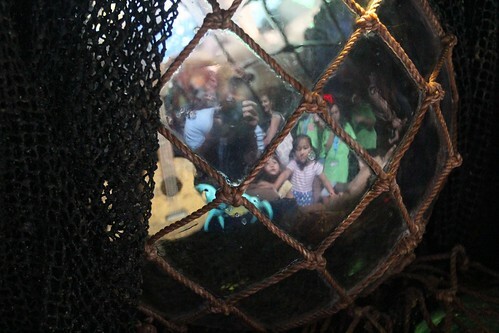 There is one scene on the ride that featured a life-size sea witch that freaked Mila out. She is not a big fan of the lady octopus. Another new area is the old toon town in the back of the park. 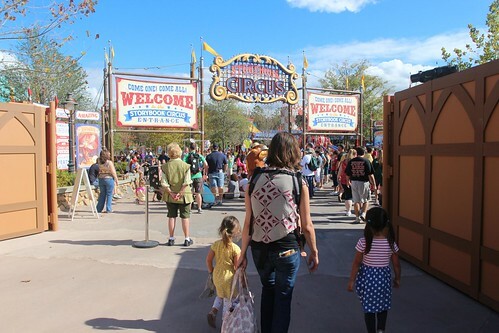 It has been completely redone and transformed into the new Storybook Circus. It houses the new Dumbo ride as well as a few kid friendly rollercoasters. Where Mickey and Minnie’s house used to be is now a circus tent. 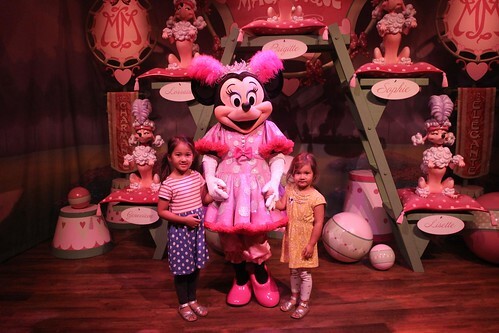 The girls got to meet Daisy Duck and Minnie Mouse there. We are starting to notice that we take a lot of the the similar photos as our last time through some of these places that we are revisiting. But we have to, we can’t leave Luka out of this experience. 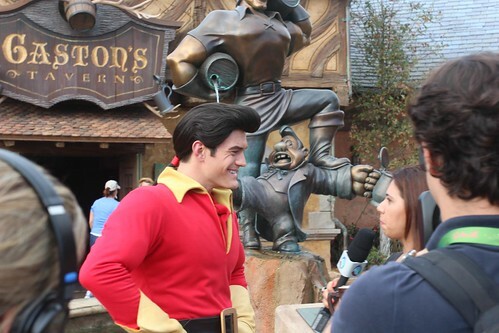 Back outside at the Fantasyland press event, they had a dude dressed up as Gaston being interviewed by some Brazilian TV show. Clearly the hair is fake, and also the muscles. But what about that chin!? I couldn’t tell if that was a prosthetic or not and I kept trying to get a closer look at it. It is an incredibly huge chin that rivals Jay Leno’s. Where did they find this guy? Last time we were here during May and we had the sun for more hours of the day. As the late afternoon approached, we were all feeling kind of worn out already. 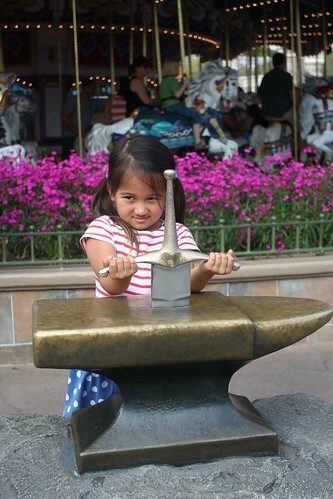 Even Ava didn’t have it in her to pull the sword out of the anvil any more. 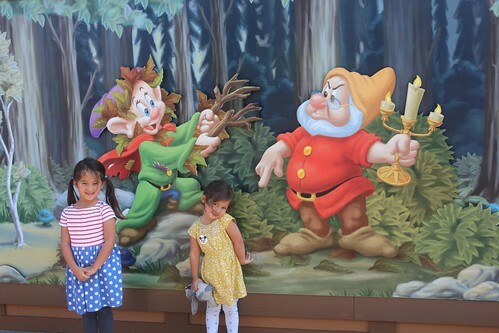 We decided to take the girls to meet some more Princesses. 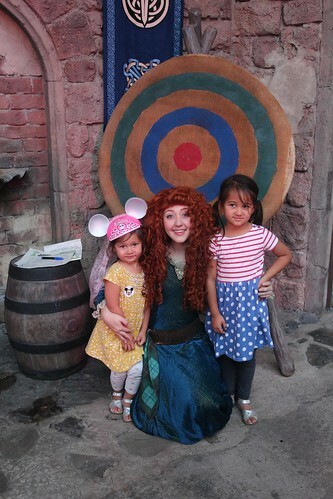 One of the newest here is Merida from the new Disney movie Brave. There was a whole new area designed and built to look like a part of her Scottish castle. As the adults waited in line for the kids to take pictures and sign autographs, the kids got to color at a big table in the middle of the area. This is Merida. She has a huge head of curly red hair. Although I was a bit disappointed that she didn’t stick to her Scottish accent for very long. 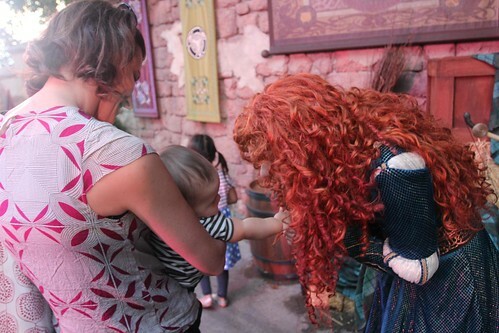 When she came to say hello to Luka, he went right for those curly red locks of hers. We were really glad that he didn’t yank them right off of her. It would have been like that scene in Elf when Will Farrell pulled the fake beard off of Santa and every kid in the room screamed. 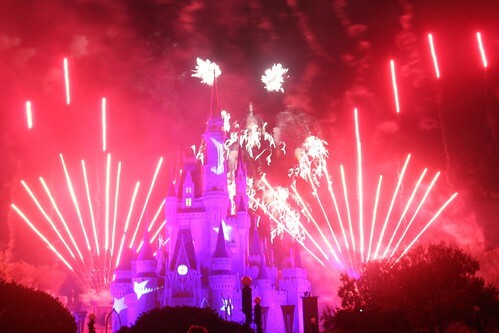 We had a great first day here and we stuck around until the first of the fireworks at Cinderella’s castle. 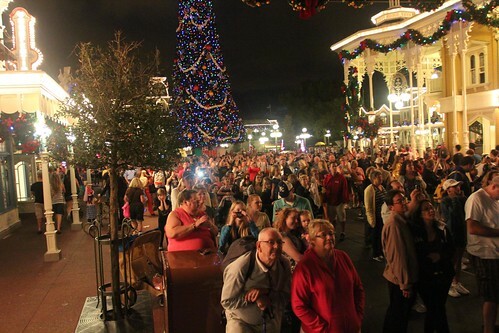 This is a little unique perspective of the show that you might not see very often in pictures of the Magic Kingdom. Check out that huge Christmas tree they got all decked out. 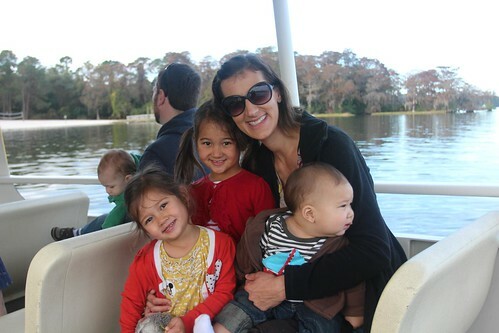 We headed back on the boat and Marlene took the girls to another sing-a-long with Chip and Dale while I went back to the Mish and made them dinner. 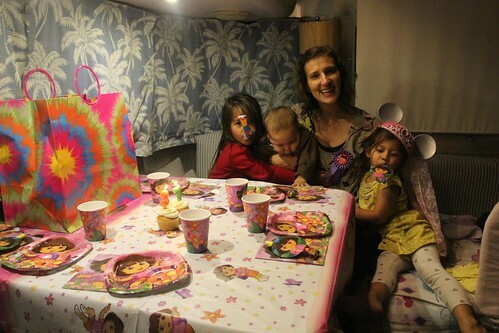 While I was there, I set up a little surprise for her with the Dora party swag I bought with the girls at Target a couple of days back. She is the 2nd of the 5 of us to have a birthday on the road. Ava will be next in January and Luka will turn one in April. I guess we will wait and see if we are still on the road by then. 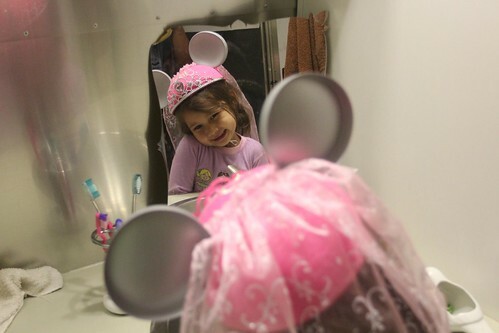 This little one had a great day at the Magic Kingdom. We could not wipe that smile off of her face all night. 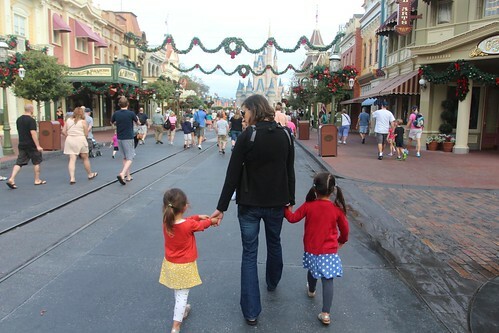 3 Responses to Day 125: A special day at the Magic Kingdom. I LOVE LOVE LOVE this entry!! It’s Ursula, not Lady Octopus. I am pretty sure they are called Lady Octopus and Fish Girl. I have been waiting for this post! You guys look like you had so much fun! I hope you got to ride Peter Pan at some point!